The Cityview 155cm is fully equipped with absolutely everything even the fussiest of felines could ever wish for. This magnificently stylish and practical piece of cat furniture provides an exciting activity play centre as well as guaranteeing beautiful views for your feline friend of their surroundings. This cat tree has been expertly designed and extremely solidly built on a surface area of 54cm squared! The baseplate alone has a thickness of 5 cm which ensures the most strong and impressive foundations that complements a robust structure. 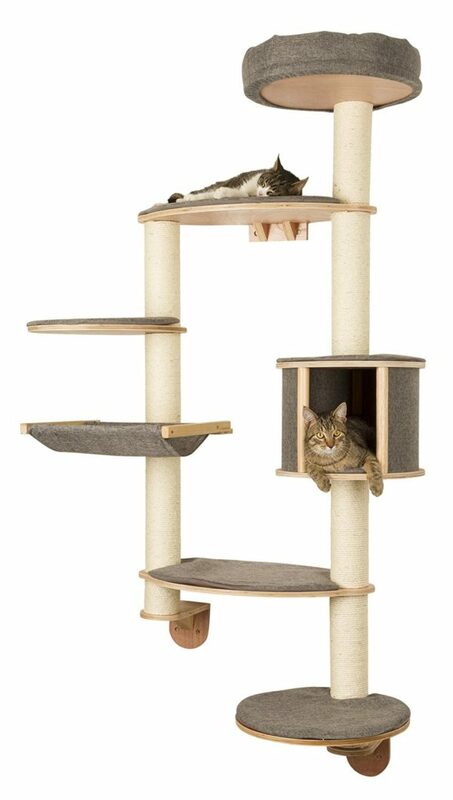 This cat tree has been dedicated specifically towards larger breeds who out-grow smaller cat trees and need something that is able to handle the additional baggage that comes with it. The spacious ground floor kitty apartment has plenty of room to happily cater for multiple felines and also includes a beautifully soft and plush pillow to add extra comfort. The top penthouse relaxing spot is also carefully and expertly finished with beautifully plush material and provides a fantastic vantage point for your feline friend to keep an eye on their surroundings just as they would in the wild.